This is a bumpy road in Rio, but at least the Americans know Klay Thompson is finally along for the ride. Thompson ended an Olympic-long slump with seven three-pointers and 30 points, and the Americans needed almost all of them to hold off France 100-97 on Sunday. RIO DE JANEIRO — Three wins from gold, and still no reason to think it will be easy for the U.S. men’s basketball team. 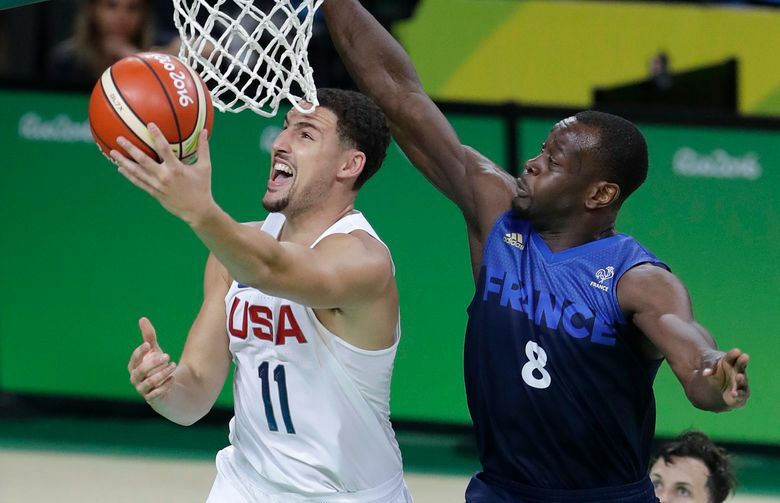 This is a bumpy road in Rio, but at least the Americans know former WSU star Klay Thompson is finally along for the ride. Thompson ended an Olympic-long slump with seven three-pointers and 30 points, and the Americans needed almost all of them to hold off France 100-97 on Sunday. The U.S. won its 50th straight tournament game, but the last three have been nothing like most of the previous 47. Winning by three for the second consecutive game, the U.S. improved to 5-0 and clinched first place in Group A. The Americans open quarterfinal play Wednesday, still the favorite but looking as beatable as ever under Mike Krzyzewski. Their opponents couldn’t be determined until the completion of play Monday in the log-jammed Group B, where all six teams are still alive. The U.S. will play whichever team finishes fourth. Nando de Colo and Thomas Heurtel each scored 18 points, carrying France while Tony Parker sat with a toe injury. Every time the Americans built a big lead, the fifth-ranked French chipped away. Durant scored 17 points after he took just four shots in the previous game, the Americans’ 94-91 victory over Serbia on Friday. After pounding China and Venezuela to open the Olympics, the Americans pulled away late to beat Australia 98-88 before edging the Serbs when Bogdan Bogdanovic missed a three-pointer at the buzzer. The Americans could never put away the French in this one, even with Thompson having his first good performance in Rio de Janeiro. Banished to the bench earlier in the tournament, he rejoined the starting lineup Sunday and came out firing — and this time, making. He entered with just 11 points on 4-for-26 shooting in the first four games. He hit five three-pointers in the third quarter alone, the last making the lead seem safe at 78-62. But the French were back within four by midway through the fourth before Kyrie Irving threw a falling-down lob pass that Durant slammed down on the fast break. Even a France team missing Parker, the four-time NBA champion with the San Antonio Spurs who had been limited to about 20-25 minutes per game here. He’s been getting back into game shape after missing time during their training when his wife gave birth to their second son last month. This time he didn’t play at all because of a toe injury. “He’s fine. He’s resting,” said French coach Vincent Collet, who also de Colo out in the final minutes after he banged his leg. Parker was hardly missed because de Colo and Heurtel kept carving up a U.S. defense that was expected to be the team’s strength but has been vulnerable against the crafty international offenses. Luckily for the Americans, this time they could count on offense from Thompson to get them through. One of the world’s best shooters had been bafflingly bad, missing 13 of his 16 three-point attempts in Rio. Krzyzewski seemed committed to getting him on track in this one and it worked. He had back-to-back threes midway through the third and the Golden State All-Star looked like a Salpico — that’s Portuguese for Splash — Brother again with three more in a 2-minute span later in the period. The way things are going, the Americans will take all the help they can get.